A little bit about me (those of you who know me already know this)… I love being physical. Whether it’s lifting weights, rock climbing or riding my bike – I love being strong and am passionate about staying healthy & active. Nine months ago, I decided to try something new – Brazilian Jiu-Jitsu. Honestly, I’ve never thought about doing mixed martial arts…that is until I ran into an old friend of mine that I hadn’t seen in ten years. He had pursued BJJ during that time and thought I would enjoy it. The next day he gave me a private lesson. I was intrigued. The day I entered the MMA academy and took my first class I literally had no idea what BJJ would entail. Let alone how physically and mentally demanding it would be. Nine months ago, I wrote this on my blog…. I’m a white belt. A beginner. It’s taken 7 months of consistent training at an average of 3 days/week (2 hours per session) — roughly 150 hours of intense focus and physically demanding rolling (training on the ground) with guys and gals that are as much as 35 years my junior to obtain my first stripe. This stripe is my first step in working towards my next level (blue) belt. I have been submitted hundreds (if not thousands) of times. I have gone home bruised and so sore that Arnica, Vitamin C, magnesium and IBprofen have become common. I have exhausted my brain cells extensively and feel as if I have lived “50 First Dates” like Drew Barrymore every time I step onto the mat. This stripe means the world to me. It represents recognition by Nolan Dutcher, BJJ black belt and owner of the studio that I train at, that I have put in the work and dedication. It is humbling to realize that I know so little and yet more than I did 7 months ago. It symbolizes the hard work that is needed to learn a new skill at an older age. It inspires me to put in the time and effort. I thank all of my BJJ colleagues and teachers for helping me along this path. 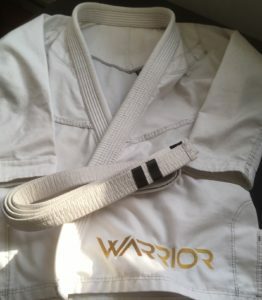 This week I received my second stripe. It feels different. It feels solid – as if the foundation for this new course in my life has been set. I am no longer the same person and yet I am still me. I’m hoping that my journey into Brazilian Jiu-Jitsu at the age of 55 will encourage others to take their first step towards a new goal.